Description: "Playable in 2D and 3D"
*First print copies come with a lenticular slipcover. 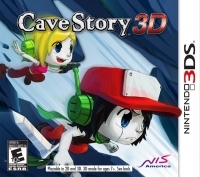 - Reminiscent of the original, CAVE STORY 3D brings a new sense of excitement and adventure! - Explore stage after stage of crazy shooting excitement! - Come to the aid of the floppy-eared, adorably endangered Mimigas! 04-21-2016 mrfoxhound Description "Playable in 2D and 3D" *First print copies come with a lenticular slipcover. 02-02-2015 puddingm Description "Playable in 2D and 3D" *Game comes inside of a sleeve with a 3D/Holographic front cover. 02-02-2015 puddingm Box Text *A New Depth In Adventure* - Reminiscent of the original, CAVE STORY 3D brings a new sense of excitement and adventure! - Explore stage after stage of crazy shooting excitement! - Come to the aid of the floppy-eared, adorably endangered Mimigas! 11-30-2012 disgaeniac Description "Playable in 2D and 3D" *Game comes inside of a sleeve with a 3D/Holographic front cover. 11-30-2012 disgaeniac Box Text *A New Depth In Adventure* - Reminiscent of the original, CAVE STORY 3D brings a new sense of excitement and adventure! - Explore stage after stage of crazy shooting excitement! - Come to the aid of the floppy-eared, adorably endangered Mimigas! 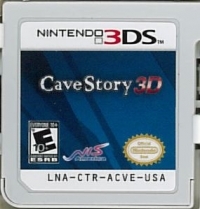 This is a list of VGCollect users who have Cave Story 3D in their Collection. This is a list of VGCollect users who have Cave Story 3D in their Sell List. This is a list of VGCollect users who have Cave Story 3D in their Wish List.